I decided to share a few photos that I took during my weekend trip to Beloit College. My husband and I hadn’t seen our son, Ben, who is finishing up his junior year, since the Christmas break. I apologize in advance for sharing family photos! Our excuse for schlepping to Beloit was to attend the college’s biannual parents committee that met on Saturday. The first thing we did when we connected with Ben on Friday was to head over to the school’s art museum to see Ben’s piece that was on display. 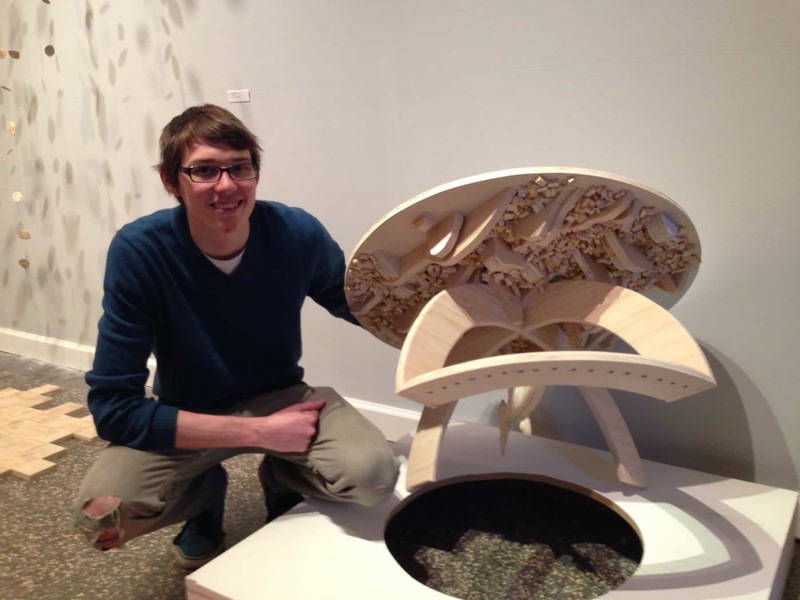 Ben and his classmates in the advanced sculpture class had to create a piece of art that used a prescribed amount of wood. Ben built a table that is particularly delightful when viewed from below. He got the trout idea from his dad, whose hobby is to take blocks of redwood from Home Depot and carve them into trout. Bruce used to fish in the mountains of his native Colorado as a boy. 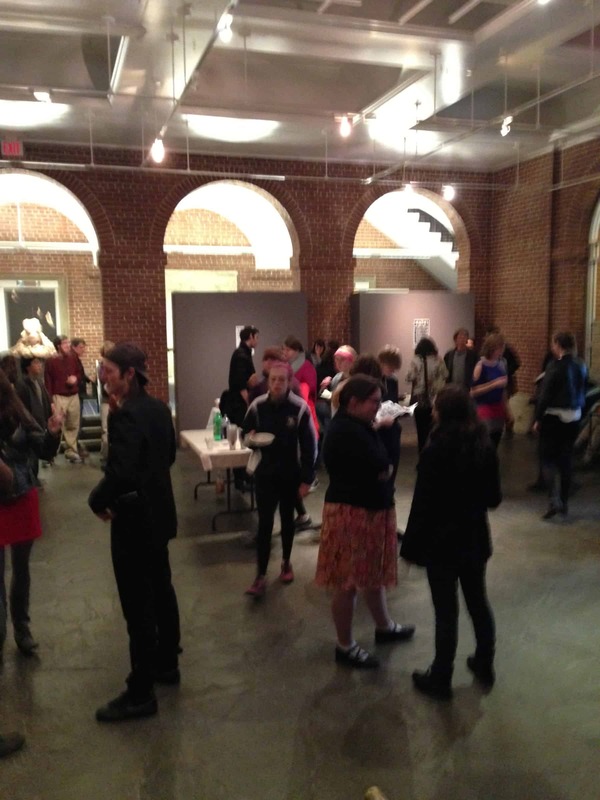 That evening the three of us attended the senior capstone event for the school’s studio art majors at the art museum. Ben had been counting on double majoring in mathematics and studio art, but it looks like he will be one class short for the art major. Ben had to give a 30-minute presentation in his Non-Euclidian Geometry class this morning and he took the opportunity to practice his talk with his parents. When he was erasing the board I told him to stop so I could take a photo. This was his reaction. Ben never wanted me to see his dorm room because it’s nothing short of disgusting. 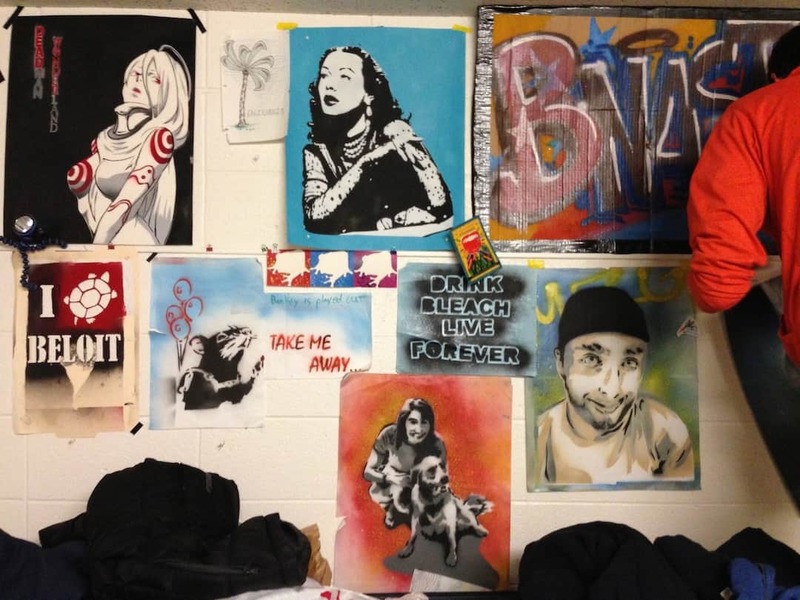 The only nice part of the room is his art work that covers all the walls. I realized on the plane trip back that I hadn’t gotten a photo with Ben and his friends or his dad and me for that matter. I guess that will have to wait for the next trip. Ben hopes to get a job at Beloit College this summer so he won’t be heading back home to San Diego. This made the trip particularly bittersweet for me. Visiting your children at college can be expensive. That’s why I would suggest finding out if the college has a guest house. Bruce and I stayed at the Beloit College guest house and we did the same thing at Juniata College when our daughter was in school. The guest house at Beloit is just $35 a night. If a spot is available, it can definitely make a visit more affordable. Hi Lynn. After all the (my!) research and great info from you and Michelle this year, FA decisions are coming in and it’s decision time. D will visit Beloit on her own in a week, and I’m so hoping she has a positive experience. She’s gotten in to several match schools, and loved Earlham, but I have a strong feeling Beloit would be great for her and for some intangible reason, sight unseen, it’s my preference. Best FA too. I wish your daughter all the best wherever she chooses. I am particularly fond of Beloit and I am very glad my son selected that school. I can’t believe that he will be graduating in May! Hi Lynn! We didn’t make it to Beloit to visit Joe this year so I’m kind of jealous! Was Ben’s math presentation for Symposium Day? Love the picture of Ben at the chalk board. His expression made me laugh out loud. I’m also amused by your comment about the “disgusting” dorm room, which I remember so well:) Sounds like a nice opportunity for Ben to get a job at Beloit this summer. Joe just left for Bucknell University for an 8 week research project, which he’s very excited about. Say hi to Bruce. Very interesting Lynn. I think if I would have been in a LAC I would have pursued a different path through continued higher education. I followed an unusual path. I was a substandard high school student, in fact I failed pre-calculus my junior year and took a step back into a lower level class in Senior year and aced it. I started college part time at a smaller state college and the calculus classes I took were in a smaller class (~25 students.) I then spent a year at community college where I took differential equations and one other math course (I forgot which) before finally transferring to a large state university. In retrospect by taking the path I did, I inadvertently skipped the large introductory classes I would have faced going straight into the large state university. Now I am an actuary at a Fortune 500 company. Funny how things work out? Thanks for sharing your story John. That really is fascinating. I do think small classes can definitely make a difference, particularly with STEM courses. That picture of your son is classic! I graduated with a math degree and a minor in English from a large state school so I am very curious about how your son’s experience as Math major at a LAC unfolds. I probably would have like a LAC better than my university experience. I had some excellent teachers but the rest were a mixed bag of disinterested professors and graduate assistants. I don’t know if Ben would have been able to hack getting a math degree at a research university. Ben’s math professors want him to succeed in this difficult major. They don’t try to wash out students. The professors are readily available if Ben or any other student needs help. 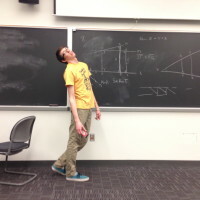 When Ben was a freshman, his professor and chair of the math department asked him after class if he understood some math concept that he had shared in class. He must have saw a puzzled look on Ben’s face. The professor took Ben into his office and explained it to him. He also told him to talk to him anytime he didn’t understand something. The biggest math class Ben had, if i remember correctly, was about 25. He told me during my visit that one of this math classes this semester has 8 students. 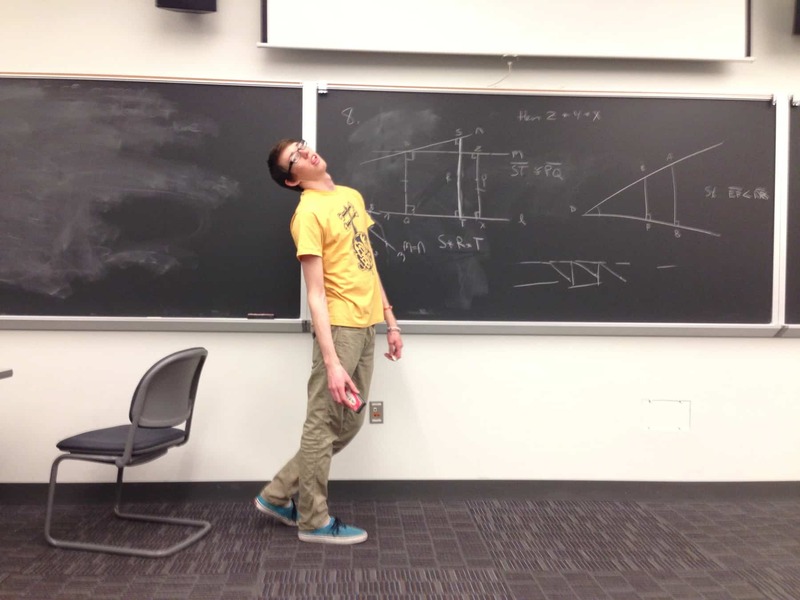 At Beloit there are 12 juniors majoring in math. (There is a photo of each of them on the math department’s school bulletin board. )That translates into a lot of personal attention. A few years ago I was talking to the then 3-2 engineering program coordinator at Washington University and he said there is a significant difference between taking Calculus, Calc II and other engineering gateway classes in a room of hundreds of students versus a couple of dozen. The liberal arts students who ended up at Wash U’s engineering school had an advantage from learning math in small, personalized settings. I suspect that all parents who follow your blog feel this way: We are in a strange period as our kids move from adolescence into adulthood. 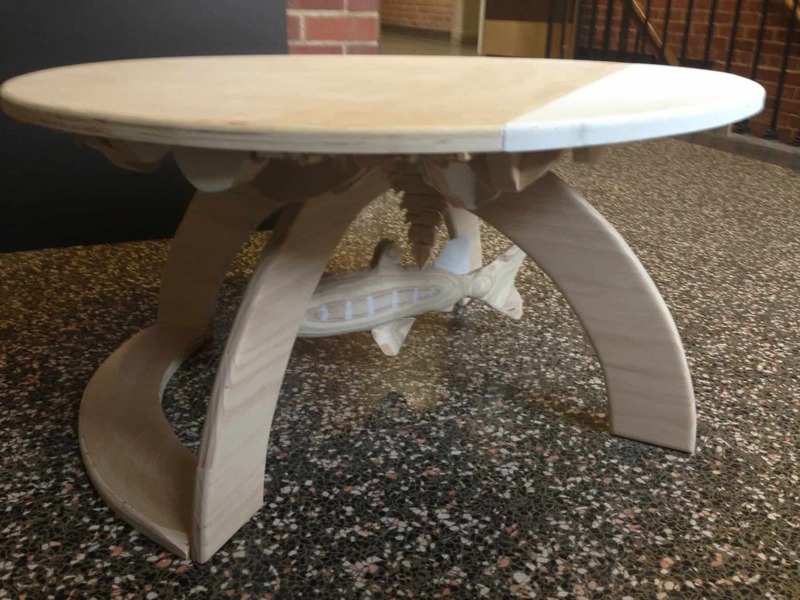 So, while the table is really beautiful, the head thrown back in exasperation is the best! It’s universal and nice to see it in someone else’s son. What a great observation Denise! Way to catch a great moment! You have to be really sharp to do that…it is a rare talent usually reserved for NatGeo photogs. Exciting to see the potential rec center… I know exactly where that is, and it will be a very nice addition to the campus. Thanks Barbara for the AirBnB suggestion. We used that website for a family trip to LA over the Christmas break, but it had never occurred to me that you could use the site for college town visits. Thanks for sharing this. We are looking at Beloit. It’s great to see an up-close, personalized view of the school–you never ever see that. It would be great if there were more of these done. I love the table! I could use a handy kid like that around. I am glad you enjoyed the post. Good luck with your college search! Our daughter is attending Beloit College. We are very happy with the quality of education she is receiving. I just read Tony Wagner’s book, Creating Innovators:The Making of Young People Who Will Change The World. Dr. Wagner makes a lot of good suggestions about how we can improve our education system. From my vantage point, Beloit College is already doing just about every single one of them. 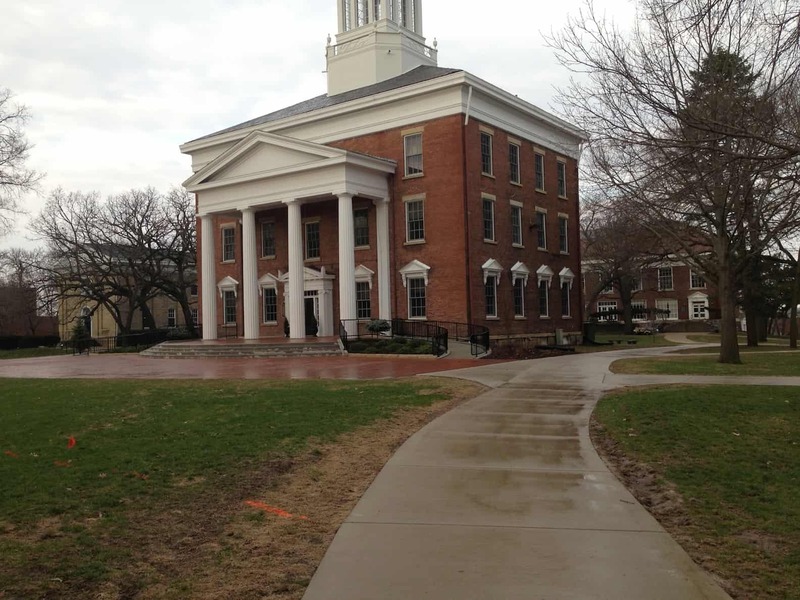 Thanks Lynn, for giving Beloit College the attention it deserves. Thanks Elizabeth for your comment. I am glad that your daughter is enjoying Beloit College too. And thanks for the book recommendation.